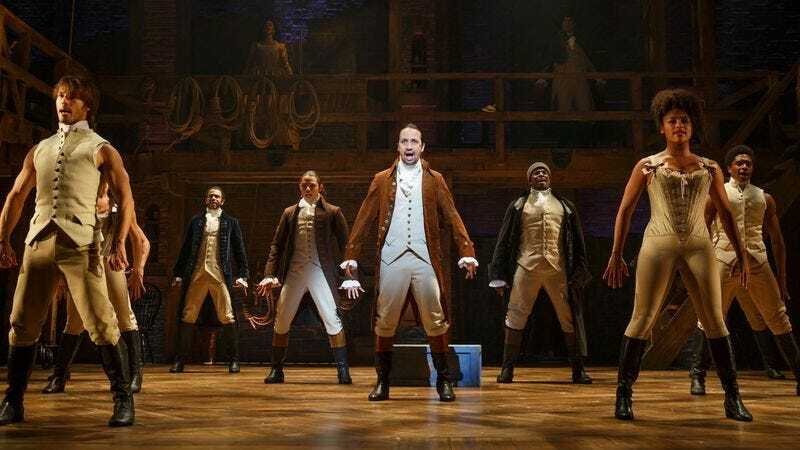 In news that should come as no surprise to anyone with even a passing interest in pop culture, The Hollywood Reporter is reporting that Hamilton is making a ton of money. While some Broadway hits, like Wicked, take years to recoup their initial investments —and others, like Spider-Man: Turn Off The Dark, tank—Hamilton has grossed $61.7 million at the box office since it debuted last July, meaning its investors have most likely completely recouped their $12.5 million capitalization. Currently, The Hollywood Reporter says, the show takes in about $900,000 a week before royalties are paid and after rent. And that’s not even taking into account the exorbitant rates that scalpers are charging for tickets. The Public Theater receives a weekly royalty of 1 percent of the adjusted box-office gross. As the sole author, Miranda, 36, gets a 7 percent cut—which means that in a typical week of eight shows he can make about $105,000 in royalties. (That’s on top of his negotiated salary for starring as Alexander Hamilton.) Both parties get an extra 0.5 percent once the show is 110 percent recouped.